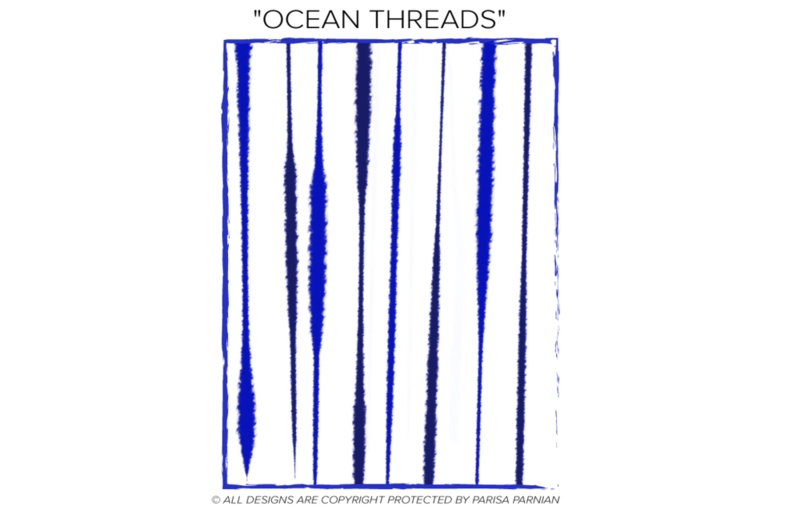 I have created and launched my own vision for an art & lifestyle design studio and brand that speaks to the diversity and beauty I see in a more global & inter-sectional way of entertaining & creating community, expressing style and exploring art. I call this brand and this lifestyle philosophy SAVAGE MUSE. 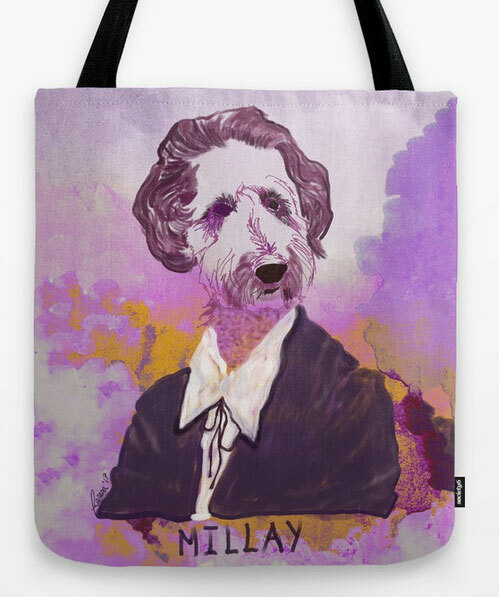 It is a world where I am exploring and being inspired by my different "muses", many of whom are women who have made a significant mark in the world of art, style, social movements, food, and literature. What makes these different women my muses is that each has stayed true to their own ideals of beauty, style, creativity, and social influence, even if their ideals went against the mainstream or standard ideals of their society and time in history. 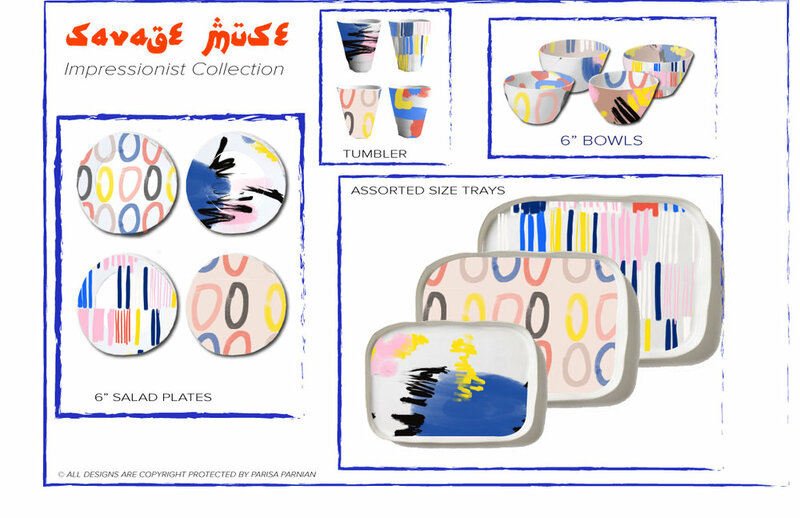 With my deep love and passion for patterns, colors and textures, one of the ways I am expanding on the SAVAGE MUSE aesthetic and brand is by creating ceramics, textile prints, and patterns that can be applied to different products. 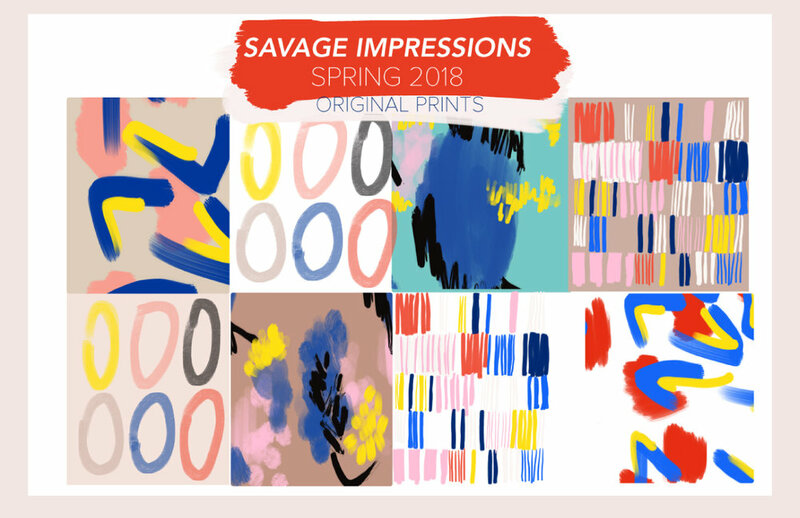 Below is a print collection called "SAVAGE IMPRESSIONS" inspired by a series of abstract "impressionist" patterns I painted. I have applied the patterns to ceramic collections and garments in this example. Click here to go to the gallery page showcasing some of the illustration work I have been doing for SAVAGE MUSE. Below is an example of a mixed media watercolor & digital art portrait I created of one of my muses, Celia Cruz. To learn more about Celia and why she is one of my muses, you can check out this piece I wrote about here by clicking here. 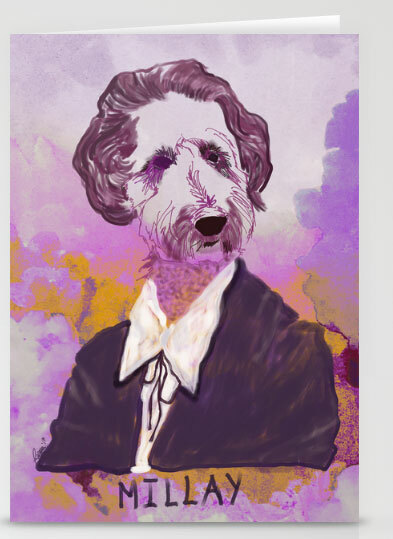 Another aspect of the SAVAGE MUSE world is to connect with and be inspired by the art world. As part of my sabbatical and personal process, I went on a two week art residency in the deserts of the Southwest, where I allowed myself the time and space to paint large format acrylic paintings. A mixed media portrait of beloved Eypgtian singer, Oum Kalthoum, in the house of a collector. 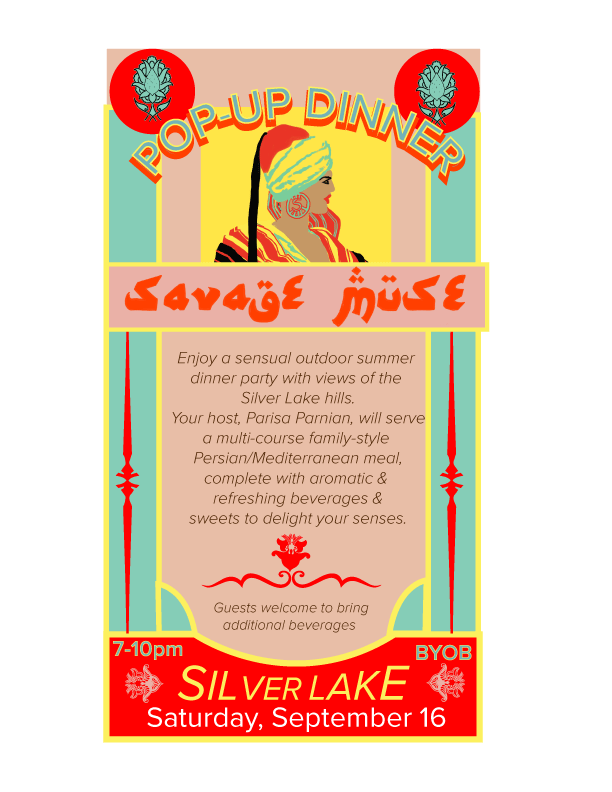 Taking my love of lifestyle design to the next level, I have begun hosting SAVAGE MUSE POP-UP DINNERS as a platform that allows me to use my visual design skills, my love of cooking, menu & event planning, and desire to build community and create memorable experiences. 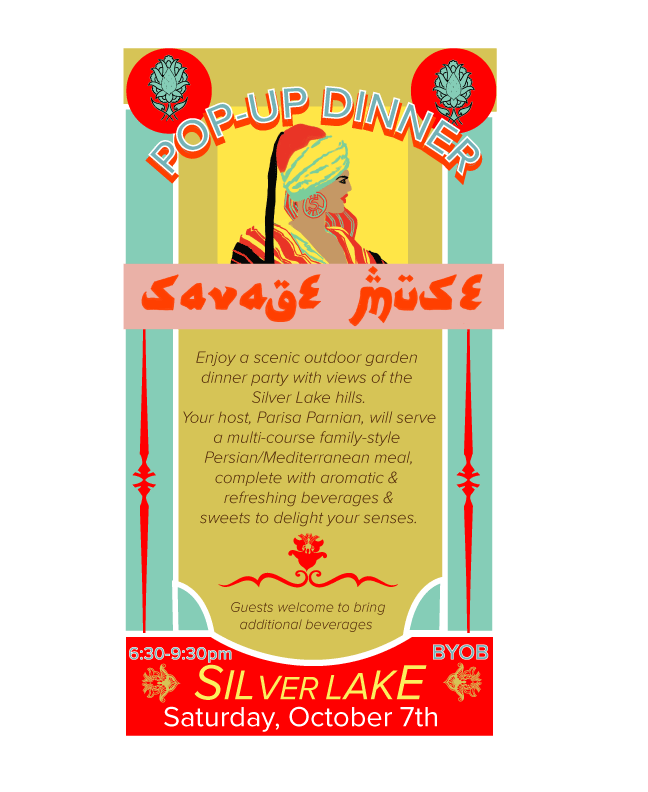 Click here to read more about the process behind these pop-up events. As part of the process of creating the SAVAGE MUSE lifestyle, I converted my garage into an art studio and workspace for both myself and creative friends to come and use. As a part of the studio space, I painted a mural on one wall to celebrate the SAVAGE MUSE vibe of the new work space. 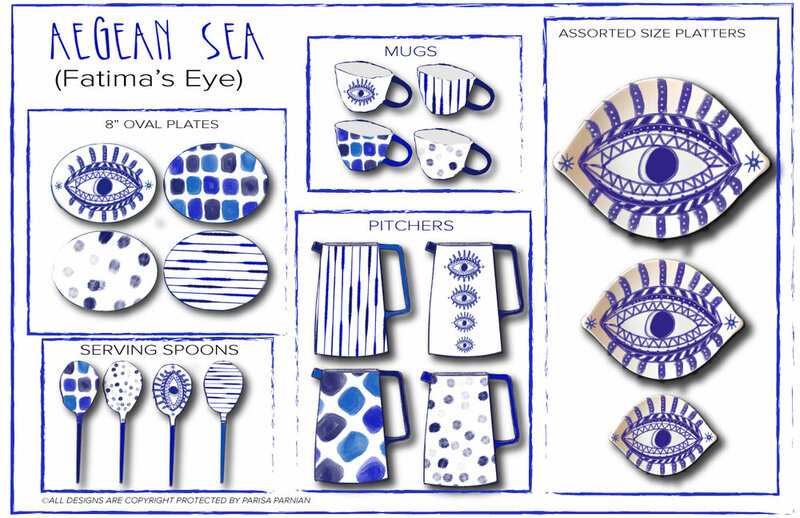 This collection of ceramics channels the colors and spirit of the Greek and Turkish civilizations that have been inspired by the Aegean Sea for many centuries. With shades of Cerulean Blues, Midnight Blue and a more mid-tone Navy Blue popping off a white background, these pieces bring a rustic sense of serenity but with a modern artisanal twist. With the Aegean Sea and the surrounding villages as the source of inspiration, this is a mono-chromatic color palette focused on three shades of blue, all framed by a white background: Cerulean Blue, Midnight Blue and a mid-tone Navy Blue. 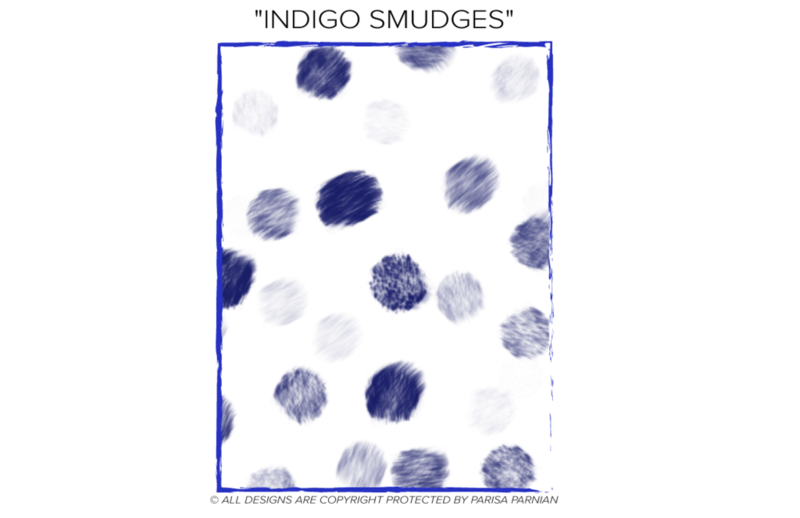 I designed four painterly patterns/artwork that compliment each other, can be used in many different scales and can be combined to create a multi-patterned piece. I have chosen several different giftable tabletop silhouettes, along with a small example of dinnerware, to create some assortments. I chose ceramic pieces that have an uneven and rustic shape to them, to further create the essence of the Aegean Sea theme. In this version, I played around with the four different patterns and created some bold pattern mixes on some of the silhouettes. Not only is there a mixing of patterns but also of scales, which adds a dynamic style quality. For this version, I added the words "AIR" "BREATHE" "SALT" and "OCEAN" to channel the sensation of taking a walk by the scenic blue Aegean Sea. The eye icon found in Greece, Turkey and most of the Middle East, has become a hot trend in the world of fashion and home accessories. This interpretation is used on novelty gift-giving items such as serving platters, pitchers and serving spoons. Last but not least, here are the same silhouettes shown in a singular pattern/art. I still made sure to bring extra interest into the selection by offering different scales of the artwork. There is so much more I could develop for this theme- both more products and silhouettes, as well as more art & patterns. This is just to show you an example of how I can flesh out a concept into fully realized collections, complete with original art and new silhouettes to expand the Magenta offerings. Window art installation designed by Parisa Parnian for the SAVAGE MUSE X DIME NAILS collaboration. Close up of art created by Parisa Parnian for the SAVAGE MUSE X DIME NAILS art installation. Details of hand-painted balls that are part of the art/window installation created by Parisa Parnian for the SAVAGE MUSE X DIME NAILS collaboration. Examples of merchandise designed for the SAVAGE MUSE X DIME NAILS collaboration. 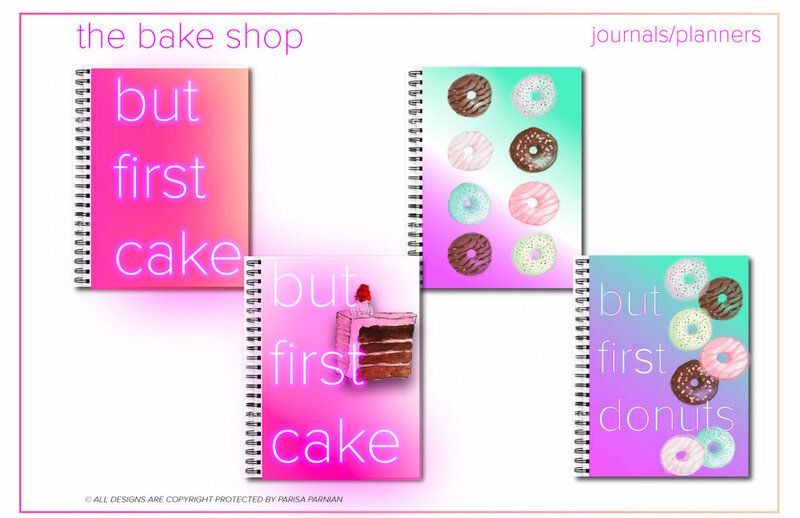 All the delicious colors, shapes and textures of a cake shop with NONE of the guilt. This collection of sugary sweet ceramics will satisfy your sweet tooth and add a celebratory vibe to your living space. All the colors of the cake shop are here, from the classic pinks and dark chocolates, to the vintage-inspired robin egg's blue and yellows. Finishes have a lustrous glaze and opaque, pigmented quality to the paint. I developed this series of lipsticks to show an example of my loose, whimsical watercolor/gouache illustration style. The word play comes from the act of seduction that is part of the romance of lipstick. 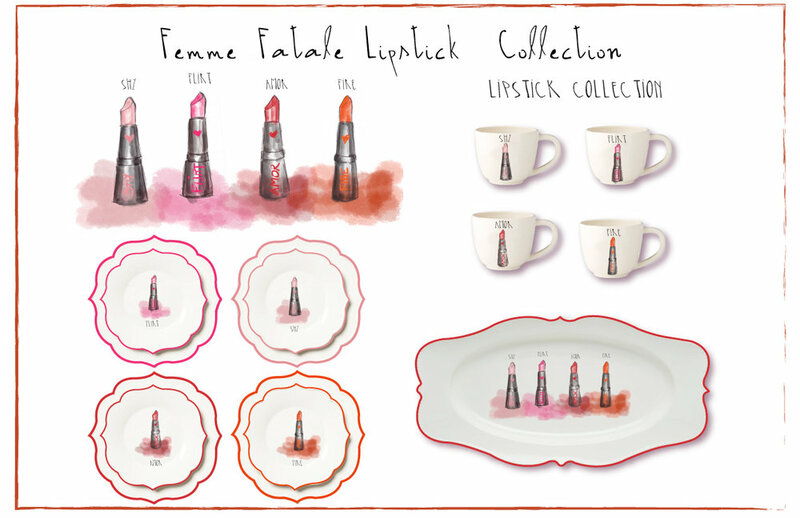 This shows my illustrations on more elaborate/fancier ceramic or melamine silhouettes that enhance the glamour and femininity of the lipstick theme. Here I have demonstrated how the lipstick collection can be translated into a more casual/rustic assortment. Directly from the runways of today's most celebrated European design houses, the FOLK-FLORIC ceramic collection is a vibrant clash of folkloric florals, geometric and animal motifs that create a whimsical yet stylishly bohemian statement. Drenched in jewel tone colors in playful combinations, this collection is bold, memorable and filled with attitude. A vibrant jewel tone collection of colors painted in an opaque, highly pigmented glaze. 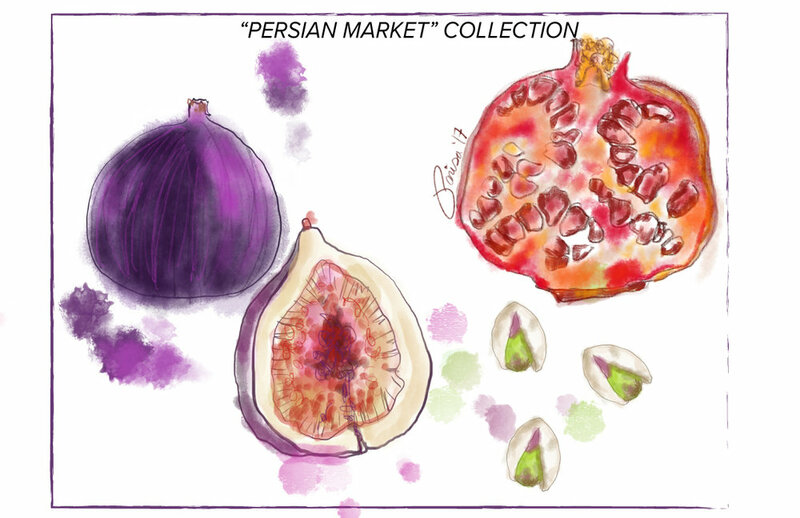 Inspired by the ingredients I use for my SAVAGE MUSE PERSIAN POP-UP DINNER SERIES, I have illustrated a few of my favorite classic ingredients that go into my Persian cooking: Figs, Pomegranates and Pistachios. I have chosen to illustrate them in that loose and whimsical watercolor/gouache technique, which these iconic images lend themselves to. 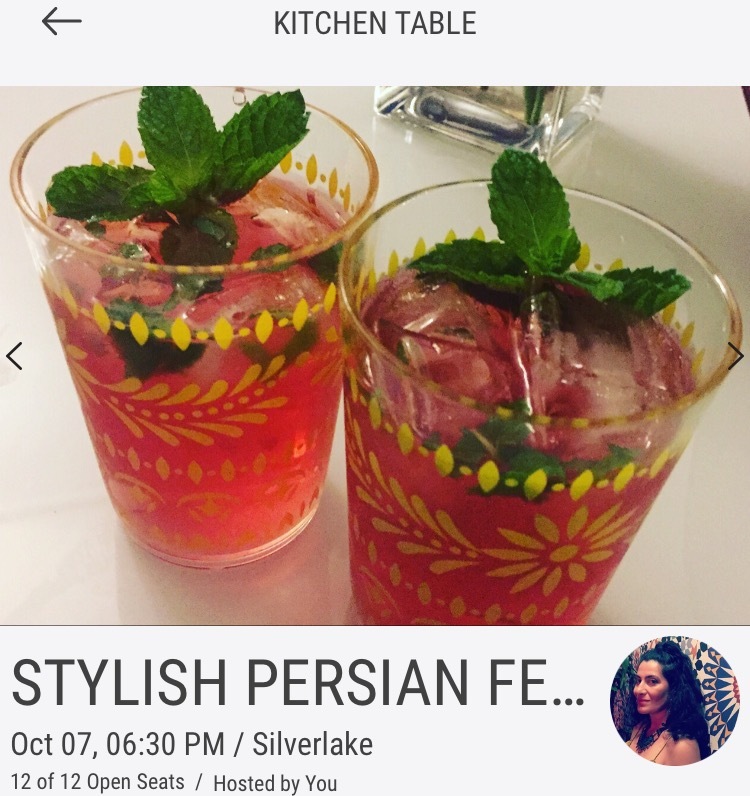 Below, I have demonstrated how the Persian Market art can be applied to some of the classic tabletop silhouettes. 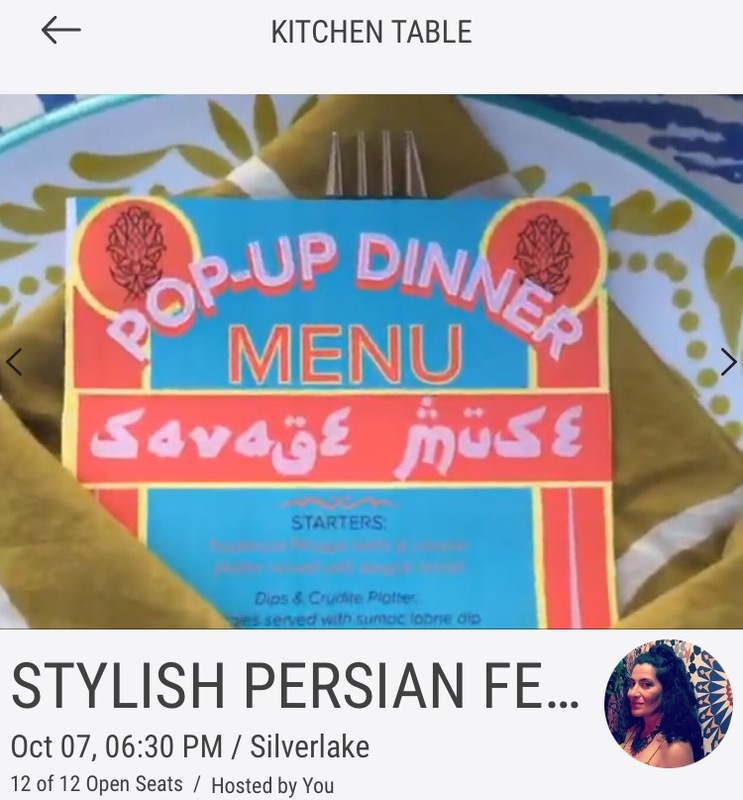 I can see expanding both the art selection as well as the tabletop and giftable silhouettes to make the Persian Market a fully comprehensive collection, complete with soft goods added into the mix. 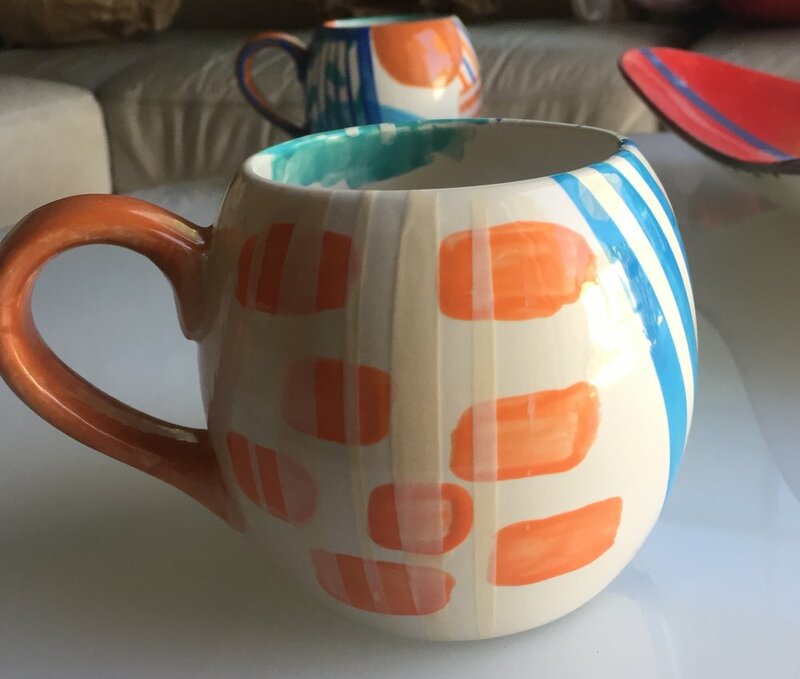 Although my professional career has predominately centered around fashion and apparel design, I have been passionate about ceramics for almost 15 years now. For me, ceramics has been yet another interesting medium to approach as a blank canvas to create art & designs on. This platter is a piece I painted on my birthday a couple of years ago. For me, going into a ceramic painting studio to paint all day is my kind of birthday celebration! This platter is being featured on a new NBC TV show about crafting called "Making It" starring Amy Poehler-- I believe it will be airing this fall/winter. 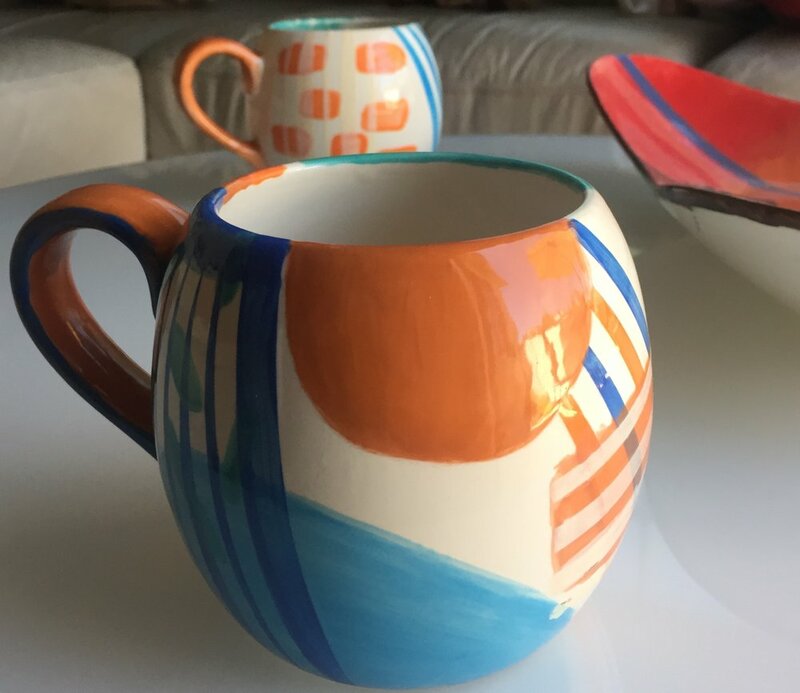 A wedding gift tradition I started about 15 years ago is to create customized ceramic pieces to reflect the love story and taste/lifestyle of the friends/family members getting married. I ask both of the people getting married a series of questions about how they met, their favorite food/dining experiences, favorite colors, travel spots, etc. Based on those questions, I choose a piece(s) of ceramic that is symbolic of their love/life and paint it to reflect their union. When my good friend and renowned Native Foods Chef & Healer, Felicia Cococtzin Ruiz of Kitchen Curandura was getting married a couple of years ago, I knew I wanted to create a special platter that she could use to serve special meals to her family for years to come. 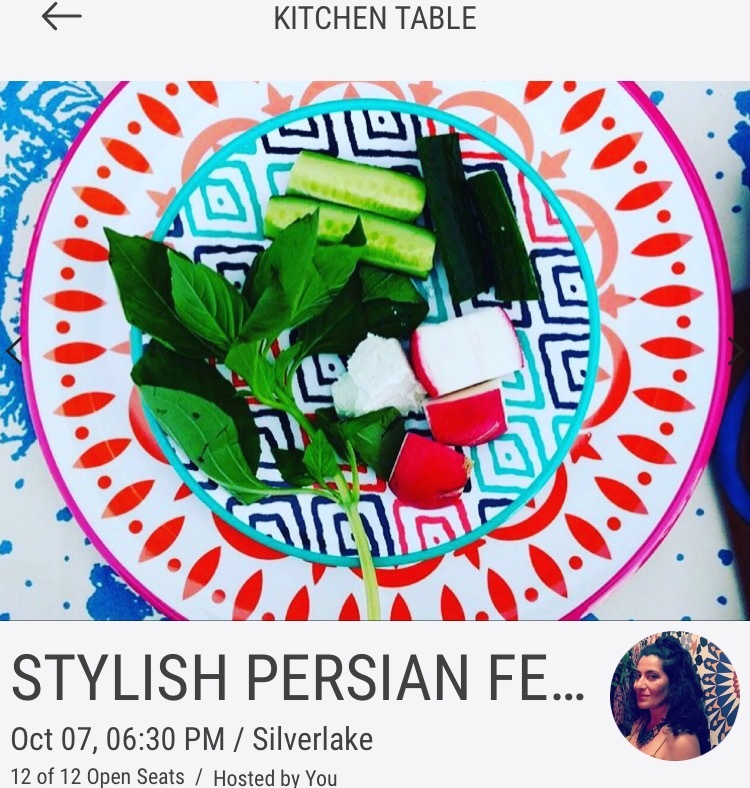 I wanted to surprise her with the platter, so instead of sending her a questionnaire to figure out what kind of ceramic I should create for her, I took a look at her Instagram page and paid attention to what colors, patterns, and textiles she was using and featuring on her posts. Based on the images, below, I came up with three different potential colorways and designs. I knew I would be limited by whatever paint colors and resources would be available for me at my local "ceramic painting" shop, so I didn't know until I went to paint the piece which of the three designs I would end up creating. The final platter design reflects Felicia's Xicana/Latina and Native American heritage and the use of the Spanish words of "Amor Y Alma" which means "Love and Soul" were my way of honoring her marriage and wedding ceremony. 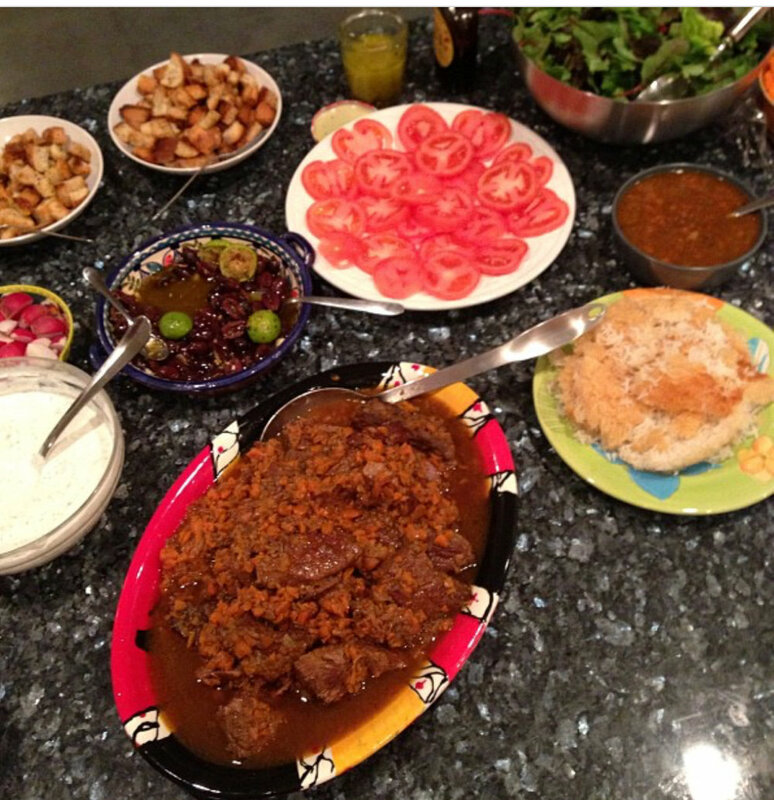 When my Persian cousin, Mahfam (who owns an artisinal food/catering company called M.A.H.F) married her Chilean chef husband, Cristobal, I knew I had to design a platter for them that they could use for many years to come and feed family and friends their exquisite culinary creations. With a love of Spain and Spanish art from the mid-century as my inspiration, I created this bold platter as my offering to their love and union. This pair of coffee mugs was designed for a beautiful couple who are good friends- she is a renowned film maker and he is a handsome actor. Their favorite romantic ritual is to share coffee with each other in bed every morning. Their favorites colors a blues and rust/oranges. They prefer more modern and geometric shapes. This collection celebrates the glamour and sparkle of the "Rosé All Day" lifestyle and attitude. It draws inspiration from two lifestyle trends: Drinking beautiful bottles of Rosé during the sun-drenched garden parties of the summer and the Rose Gold metal accent trend that has been the metal finish of choice with the fashionable set. A blend of matte and metallic finishes, this color palette of blush pinks and metallic gold and rose gold is the epidemy of feminine glamour. 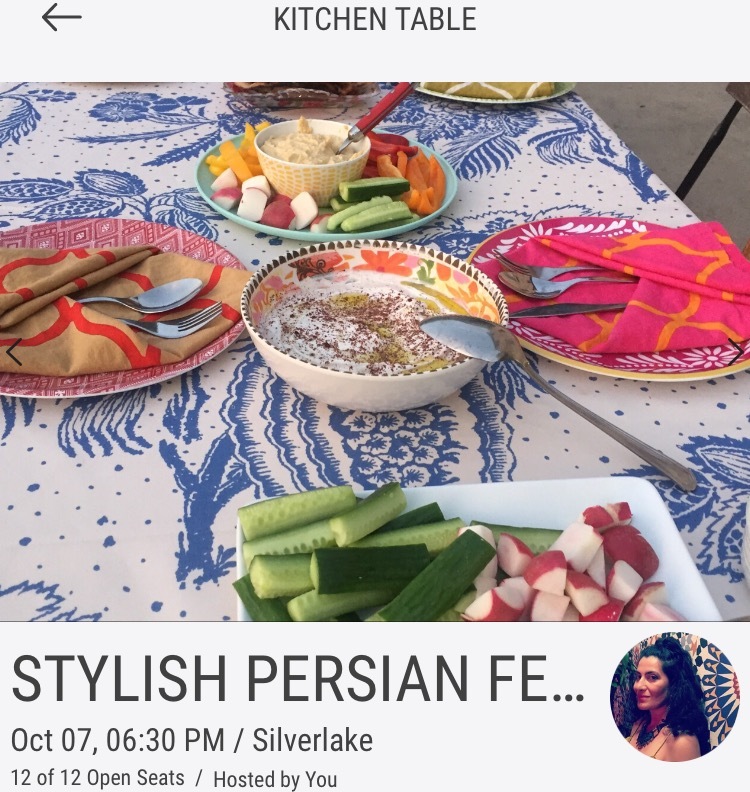 Home to me and many other creatives here in Los Angeles, Silver Lake is a bohemian hide-away that has been influencing the world of ceramics and lifestyle design for many years now. The SILVERLAKE & SUNSET ceramic collection takes inspiration from the sun-bleached desert colors, hand-made shapes and imperfect geometric art that has become synonymous to casually stylish Southern California living. Sun-faded desert colors and two types of finishes: matte as well as a semi-opaque glaze give this collection the mood and attitude that is Silver Lake and modern bohemian California living. Adding a touch of gold to a handle of a cup or as a brush stroke accent on a painterly design adds modern luxe elegance that takes any ceramic collection to the next level. A great way to elevate an existing collection or a great design focal point to launch a new collection with, you can't go wrong with "the Midas touch". Enhancing the surface of ceramics with hand-made, artisanal textures brings interest and depth to any ceramics collection. It is like adding dimension to table settings or home decor that feels and looks like modern sculpture found in an art gallery. Botanicals, especially lush, leafy jungle-like plants, have taken the home accessories/design world by storm. 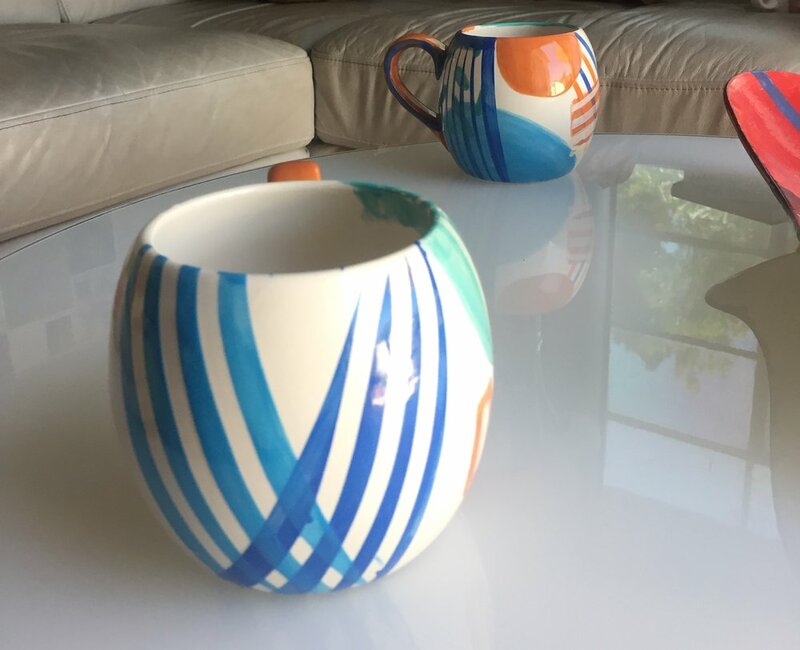 With wildly successful influencers such as @jungalow capturing the home decor world's adoration and attention, it is clear that these tropically-inspired ceramics are a welcome addition to the home or office space. 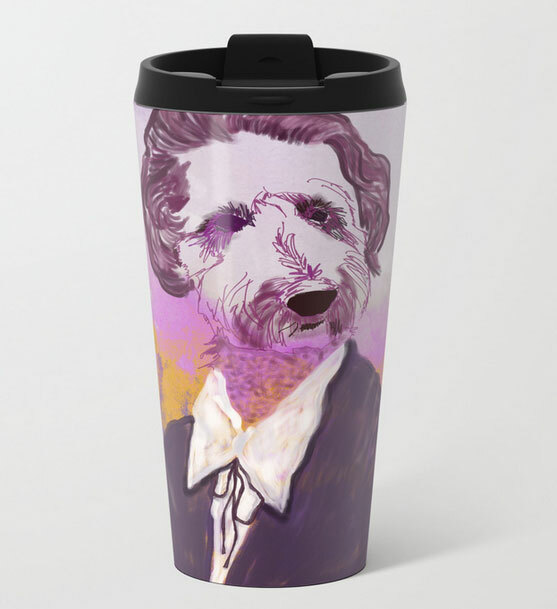 Quirky, abstracted faces full of playful or dramatic expression give novelty ceramics a memorable twist. Great for gift-giving, these whimsical face ceramics add a lot of personality to any retail space.